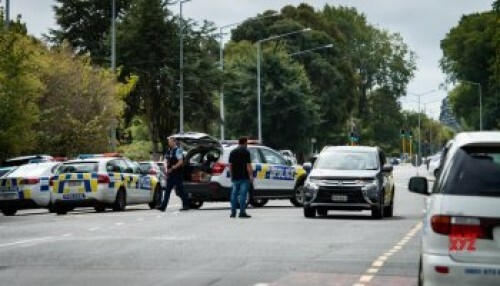 Christchurch, March 15 (IANS) Fear shrouded New Zealand's Christchurch city on Friday as survivors recounted horrifying details after 49 people were gunned down in deadly shootings at two mosques in the city centre. The violence began when a gunman, dressed in dark clothing, opened fire in the Al Noor Mosque in central Christchurch where a prayer session had been going on inside, the New Zealand media reported. Prime Minister Jacinda Ardern called the killings "a terror attack" and one of New Zealand's "darkest days". Witnesses said there were around 400 people in the Al Noor Mosque at the time of the attack and they ran for their lives after hearing gunshots. Around 100 were there in Linwood Avenue Mosque, the second mosque targeted. One unnamed survivor who had blood on his clothes said he saw the gunman shoot a man in the chest at the Al Noor Mosque. The witness said that the shooting there lasted for 20 minutes. "I was thinking he must run out of bullets... What I did was basically waiting and praying, God please, let this guy run out of bullets," the witness told broadcaster TVNZ. Ramzan Ali, from Christchurch, told the New Zealand Herald that fellow Muslims were gunned down next to him as he dived out of the window of the Al Noor Mosque. "I saw people running for all the doors. To get 300 people out of the doorways was not easy, out of two doorways, because he (the gunman) entered through the main door and there were two more doors on the sides." Ali said he dived behind a bench, although his legs were visible. "He (the gunman) just started shooting 'Bang, bang, bang'." He said the shooting stopped and restarted seven times as the shooter kept reloading ammunition. "I'm thinking, 'Oh my God, I hope he finishes his bullets. I hope he finishes them'." Ali then managed to dive through an already-broken window and then into Hagley Park. "I was the last person to get out of the mosque alive," he said. "I could say I was blessed. I was lucky. Allah was looking out for me." However, his brother Ashraf wasn't lucky enough as he was left behind in the mosque and was missing. Mohan Ibrahim was also with around 400 people who were praying inside Al Noor Mosque when the shooting began. "I didn't get a glimpse of the gunman as I was in the next room, but all of a sudden we heard the shots being fired and people just started running for their lives. I'm still in shock. "A lot of people have been killed and many are injured. I saw a girl dead in the middle of the road," Ibrahim said through tears. Sophie Nears, 19, told the Herald her friend had called her screaming that he had been shot in the leg and he was hysterical. "He just hung up and I haven't been able to get back in contact with him. He was screaming that heaps of people were dead and then the line just cut out." A 14-year-old high school student in Christchurch said that his uncle was one of the people who got shot. After seeing people falling down, he just ran as fast as he could, all the way to the nearby Hagley Park. "The gunshots sounded like pop, pop, pop ... I heard over 50," the boy said. About 110 rounds of shots were fired reports said. Another man who survived by hiding said people broke through windows to escape. At the second mosque, Linwood Masjid, survivors said they saw a gunman in a black motorcycle helmet open fire on around 100 people praying inside. Witness Syed Ahmed told stuff.co.nz the man had been "shouting something" during the shooting.